If you're the type that likes to include home made GIFs with your texts, Google's Gboard app for iOS now makes it easier to create one. The button to start the process has been moved on the QWERTY keyboard to make it easier to find. 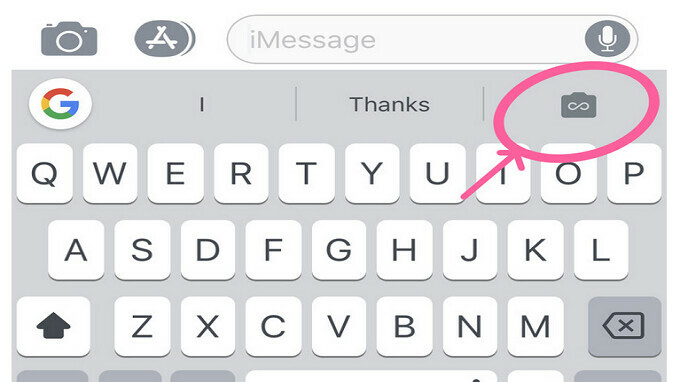 Originally, when the feature launched last September, the GIF creation button was found behind the emoji button on the bottom of the keyboard. Accessing it required a long press on the emoji icon at the bottom. Thanks to an update, the GIF creation button has been moved to the word suggestion bar, making it easier to find (see the arrow on the image at the top of this story). Tapping on the icon will allow you to record your own GIFs using either the rear-facing or front-facing camera. You also have the options of recording a 3-second "Loop," or a "Fast-Forward" GIF that records up to one minute of action, and speeds it up for laughs. If you're happy with the GIF you create, you can then copy and paste it into your text. While the update has been disseminated to the iOS version of the app, the Android variant has not yet received it. If the Gboard keyboard did not come with your Android flavored handset out of the box, or you have an iPhone that you want to try it on, click on the appropriate link: (iOS|Android).